The Ten Point Star is the easiest of the Jewel Box designs. 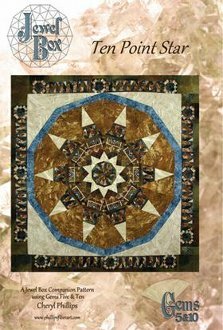 The cover quilt is made by "fussy cutting" the Northcott Stonehenge Fabric Panels. Instructions are in booklet form with full color graphics and the framing templates. So simple to follow--You'll be amazed. Jewel Box tools: Gem Ten and Gem Five are required. Finished Size is 60" x 60".